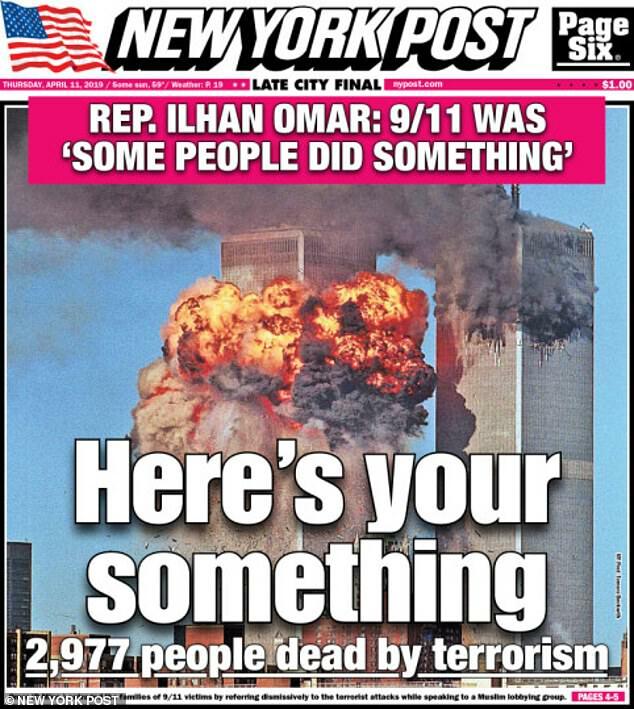 Donald Trump harangued Muslim-American Congresswoman Ilhan Omar for referring to the 9/11 terror acts as 'some people did something,' sharing a video on Friday night that shows graphic images of the attack and its aftermath. 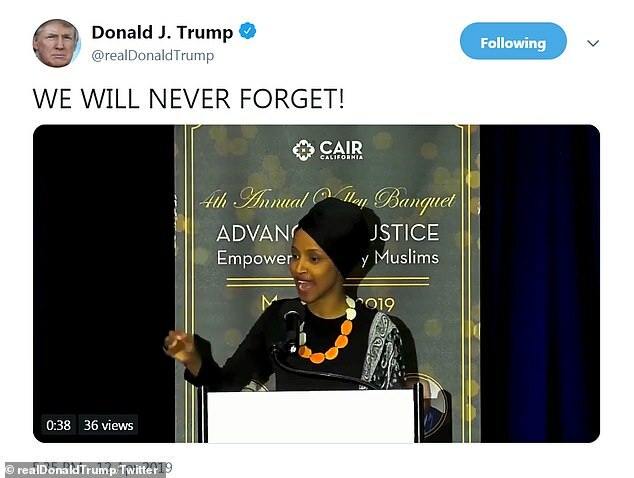 He tweeted 'WE WILL NEVER FORGET!' 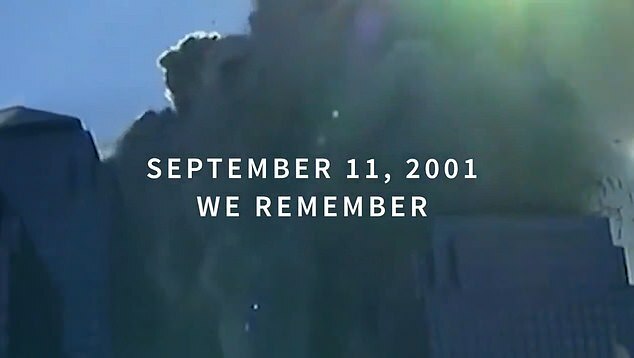 and a 43 second video that showed Omar's comment during a speech to the Council of American-Islamic Relations (CAIR), interspersed with footage from September 11. 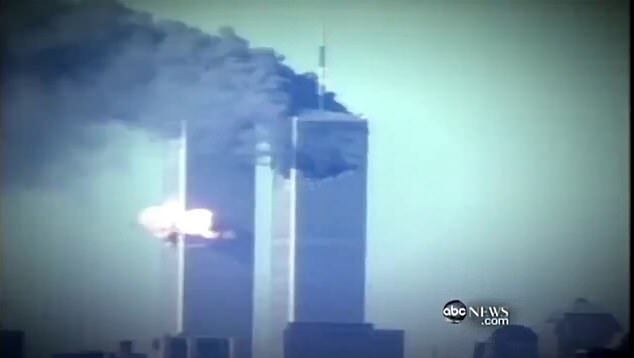 The video does not include Omar's full statement, 'CAIR was founded after 9/11 because they recognized that some people did something, and that all of us were starting to lose access to our civil liberties,' or any other soundbites from her speech. 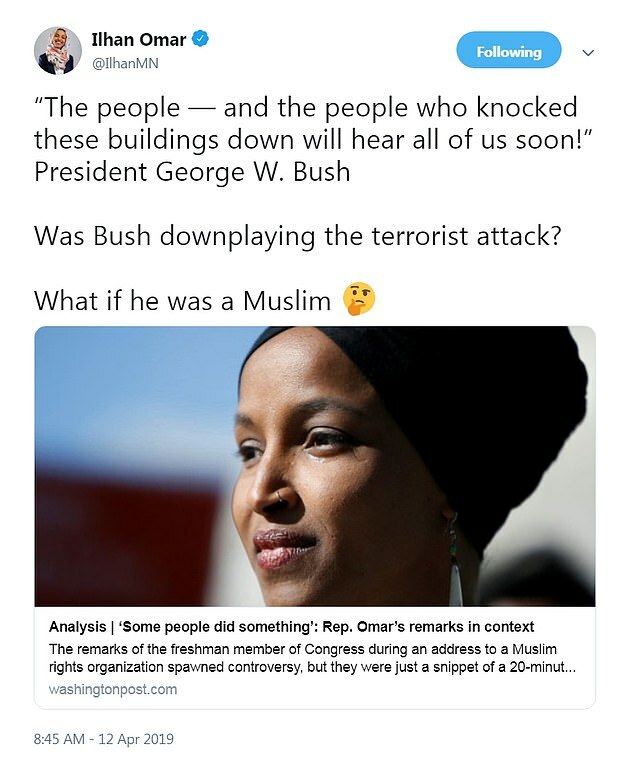 His assault came after Omar compared her controversial comment to one George W. Bush made after the attack, suggesting Friday that he would have faced similar backlash if he were Muslim. Progressive Democrats, including Sens. 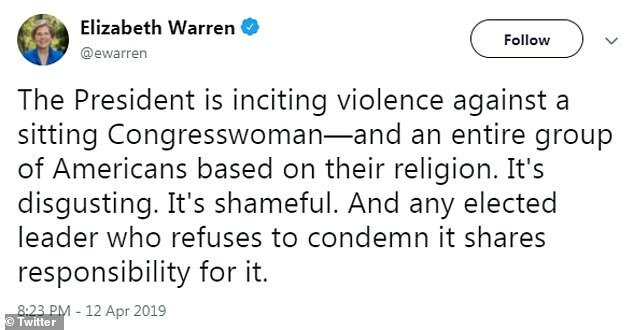 Bernie Sanders and Elizabeth Warren, lined up to support Omar in response to a plea from Rep. Alexandria Ocasio-Cortez for fellow lawmakers to condemn Trump's tweet targeting the freshman congresswoman. 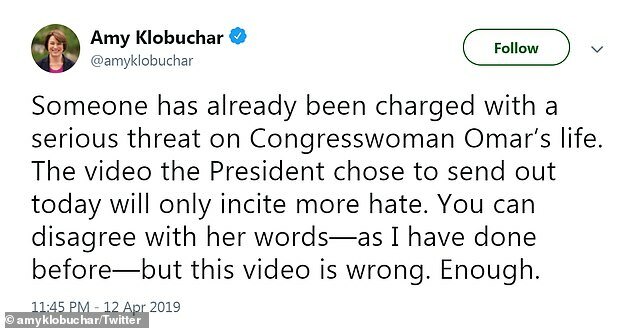 They called the president's behavior 'disgusting' and noted that Omar was receiving death threats. 'So you can’t just say that today someone is looking at me strange and that I am trying to make myself look pleasant. You have to say that this person is looking at me strange, I am not comfortable with it, and I am going to talk to them and ask them why. 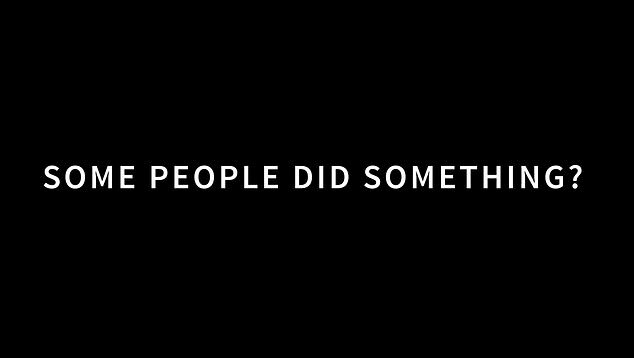 Because that is the right you have,' she stated. 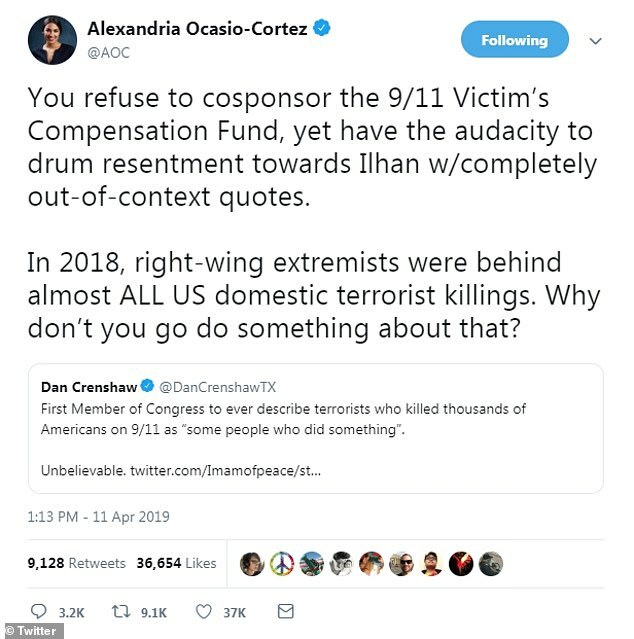 After Trump amplified Omar's remarks on Friday night, Ocasio-Cortez called on fellow lawmakers to support the Minnesota congresswoman. 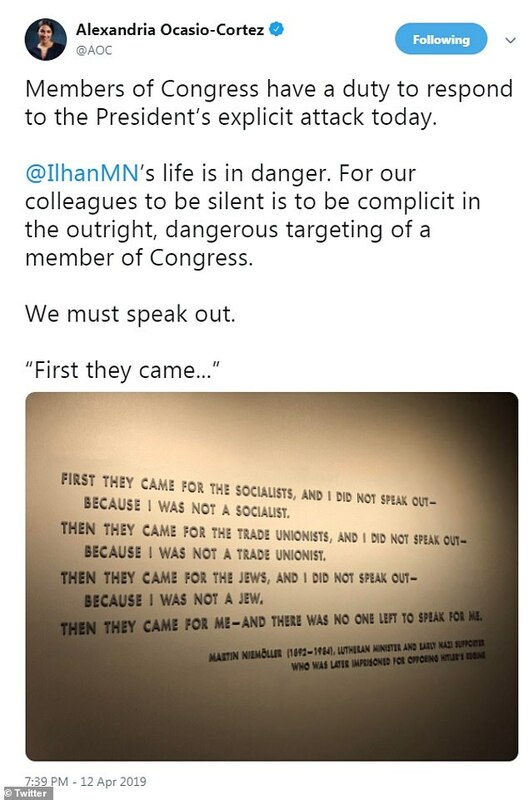 AOC shared an image of Martin Niemöller's 'First they came ... ' poem as part of her call to action. The version of the poem she shared says: 'First they came for the socialists, and I did not speak out— Because I was not a socialist. Then they came for the trade unionists, and I did not speak out— Because I was not a trade unionist. Then they came for the Jews, and I did not speak out— Because I was not a Jew. 'Then they came for me—and there was no one left to speak for me,' the last line of the poem that's featured in United States Holocaust Memorial Museum says. 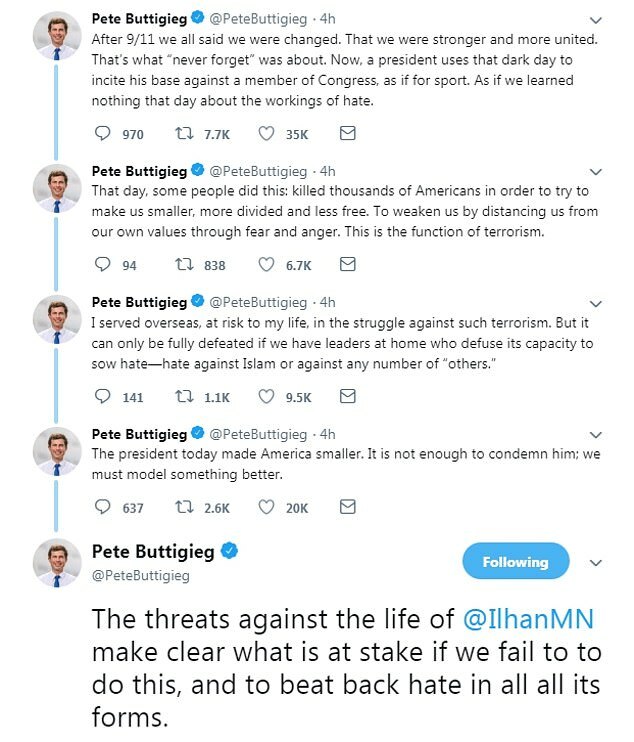 Buttigieg, who served in the U.S. Navy reserve, tweeted: 'I served oversea, at risk to my life, in the struggle against such terrorism. But it can only be fully defeated if we have leaders at home who defuse its capacity to sow hate - hate against Islam or against any number of "others."